PicShrink the incredible image compressor to edit, convert and compress digital image in bulk. Easily optimize many image formats such as jpg, gif, png, bmp using a powerful image compression engine, shrink the large file size of your photo files, optimize pictures for faster uploading to the Web, e-mail smaller image files quickly not exceeding email size limitations. More features: Add Watermarks and adjust contrast, lightning and intensity. PicShrink the incredible image compressor to edit, convert and compress digital image in bulk. Easily optimize many image formats such as jpg,gif,png,bmp using a powerful image compression engine, shrink the large file size of your photo files, optimize pictures for faster uploading to the Web, e-mail smaller image files quickly and not exceeding email size limitations. 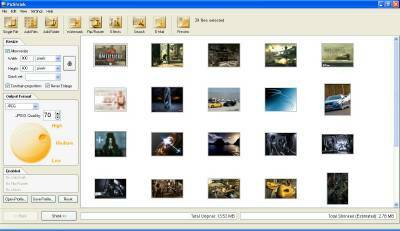 PicShrink can be started directly from Windows Explorer to optimize image folders without opening the program. More features: Add Watermarks and adjust contrast, lightning and intensity. PicShrink free trial version can be tested for 30 days without any limitations.